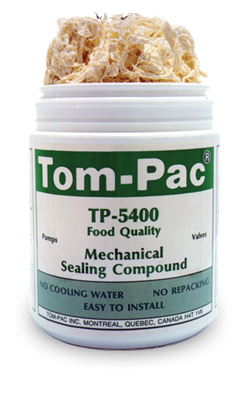 TP-5400: Food grade / light colored | Tom-Pac Inc.
TP-5400 Sealing Compound is chemically inactive within a wide pH range. It can safely be used to handle all food applications. TP-5400 complies with all USDA regulations. Its whitish color makes it ideal for installations where a light color material is desirable, such as fine paper applications. TP-5400 is also recommended for use in applications that have brass or bronze shaft sleeves. Like TP-4000, TP-5400 will seal most rotating or reciprocating equipment. It is easy to install and the only maintenance required is small additions of compound, after long intervals. This procedure can be performed on-line, without having to shut down the equipment. TP-5400 can also seal valves the first time for the last time. It will not crack or harden, so valves are always easy to turn. View the installation video when online injection will not be used in the future. Delivers exceptional longevity and zero leakage solution for harsh Continous Hydrolizer application. Online injection allows for quick maintenance, minimizing exposure to dangerous fumes. USDA H1 TP-5400 Sealing Compound can be used in the food industry for sealing mixers, agitators and positive displacement pumps.